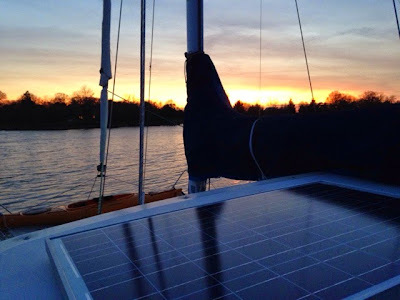 Day 13 (Mon): We left the marina today! Our broker/instructor couldn't make it but we went for it anyway. 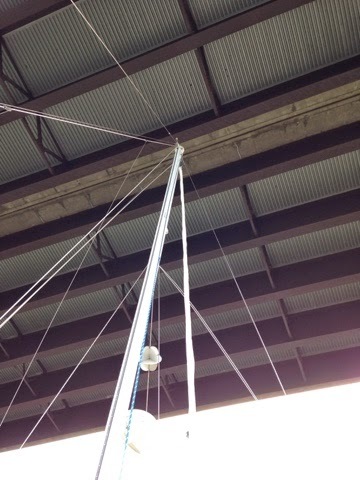 After we untied the lines, the wind blew us off the dock, so all the Captain had to do was put it in reverse. We went out into the South River to practice maneuvers on a speed marker then headed for Oak Grove Marina for fuel & a pump out. It wasn't pretty. The current & wind were trying to blow us away from the dock, but again leaving was easy. Release the lines and we floated away. Then it was a short motor down to Harness Creek. He dropped anchor 1, 2, 3, 4 times. We finally decided it was set, but the Captain couldn't nap until I came out into the cockpit with my kindle (He had a restless night. Go figure). We were swinging quite a bit because of the opposing wind & current, so we finally put out the second anchor. Our first sunset at anchor. This is our shake down trip. Motor (the starboard engine is officially Lokie and port is Thor), dock (meh, we need practice), anchor (got lot's of practice! ), monitor electrical draw down, water conservation, holding tank. It's going to be a restless first night, but WE DID IT! It's a short dinghy ride or paddle to a beautiful park with a dock. Another 1.5 mile walk to West Marine & the grocery store. A little rain won't stop my photo op. Nice anchor set up. Our second day at anchor: Well it's raining and cool, so I get up early and make percolator coffee on the stove. Breakfast is brownies (cooked in the oven in a silicon muffin tray cut in half. They were a little burnt on the bottom, so next time I'll move the rack up but otherwise the oven works great). We were slowly dragging, so we moved back & reanchored with a bow & stern anchor. (The First Mate finally gets to do some boat driving!) The batteries got an extra charge so the TV marathon begins. There's a break in the rain showers, so I bolted for the kayak. 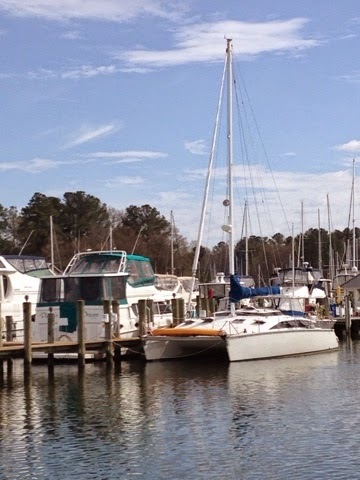 I successfully paddled to the dinghy dock, tied off and exited the kayak (without swimming), threw away some trash and jogged up to get a picture of the boat from the nearest overlook (the park is closed today). A second sailboat shows up. My Captain makes sautéed Brussel sprouts and chicken with a bottle of Frogs Leap Rutherford wine for dinner. Captain took the strip off of one side. Strip or no stripe? 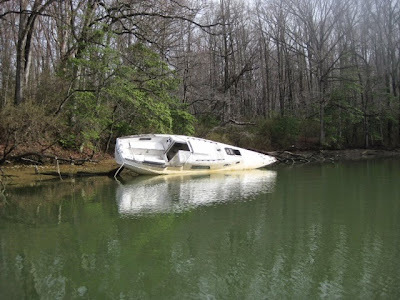 Third day at anchor: A lazy day for the retired couple! I made coffee & muffins to warm up the cabin. 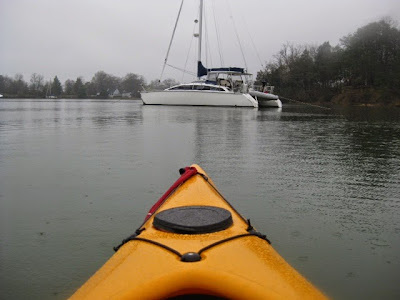 Then I kayaked over to the dinghy dock and walked to the grocery store (eyes bigger than backpack). I was back by lunch, so Craig left in the dinghy (we're not ready to leave the boat unattended yet) and walked to McDonalds and West Marine. By then, it was time time to start the risotto for dinner. A Lost tv marathon was followed by an early night to bed (we are planning on pulling up anchor in the morning, but the real reason is it's getting chilly on the boat! We do miss the space heater at night, but the Coleman winter-weight sleeping bag as a comforter with flannel sheets are brilliant!) The water was like glass overnight so we slept great. I kind if hate to leave this anchorage. 1) It's free (yep, anchoring out is free!) 2) I hadn't fully explored the park either by trail or kayak 3) Did I mention there was a McDonalds? But we're ready to keep heading south. Leaving Harness Creek for Herrington Harbour: I was up by 6:00 am. Coffee & leftover muffins for breakfast (loving the Coleman's thermos I bought. The coffee will burn your tongue for 2 hours!) 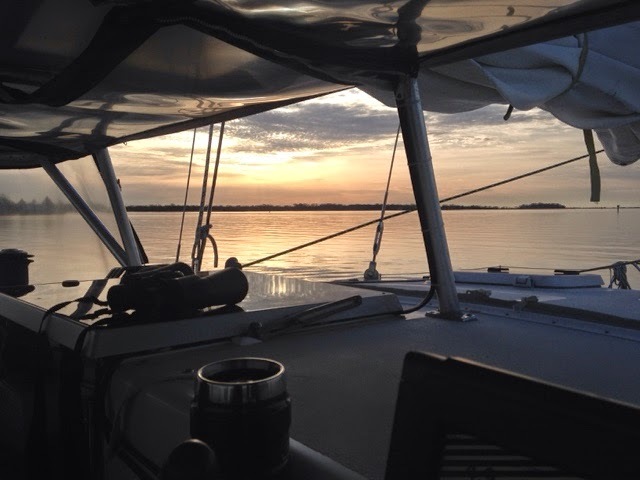 We were motoring out of Harness Creek by 7:30 am with the First Mate at the helm. 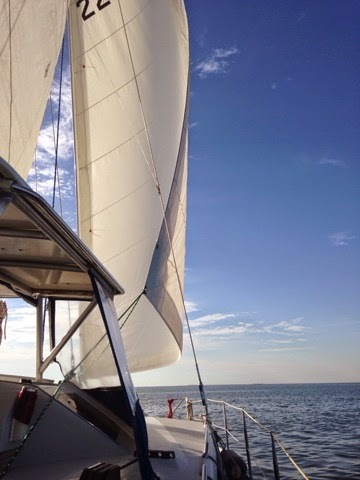 As soon as we entered Chesapeake Bay and picked up a heading of 200, the sails went up. 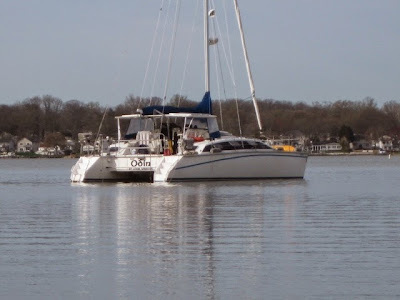 We had a wonderful quartering tailwind on a broad reach--perfect for our catamaran. We averaged 5 kts but saw 7.0 kts very briefly (although the chartplotter claims we hit 11.4). We saw a max water depth of 30 ft. We also got a brief glimpse of the shipping channel. Autopilot functional. It was a 14.1 mile trip, that took us about 4 hours total. We sailed a good 3/4 of that. Sail are up! I repeat, THE SAILS ARE UP! Amelia the cat woke up in the middle of all this. When I went to check on her, she was wide-eyed, but apparently it was because she was locked in our berth. She headed out, had some lunch, and went back to sleep on the settee. The wind died just before we reached the entrance to Herrington harbour so we fire up the engines early. Our docking still needs work. It's a beautiful day. We sit in the cockpit and have lunch. Pretty soon we both wander off the do chores. My Captain is swabbing the deck again. I'm headed to do a quick round of laundry. Amelia is taking a nap. For the first time, as I stand at the marina deli, it feels like the ground is moving. I guess I've gotten used to being on the boat and terra firma feels weird! I explored the marinas eco trail, which takes me to the far side of the marina for a good photo op. Bonnie check out a post I did on my cooking blog about oven basics. If you use a pizza stone or terra cotta tile in the bottom it will even out the heat. No more burned brownies!